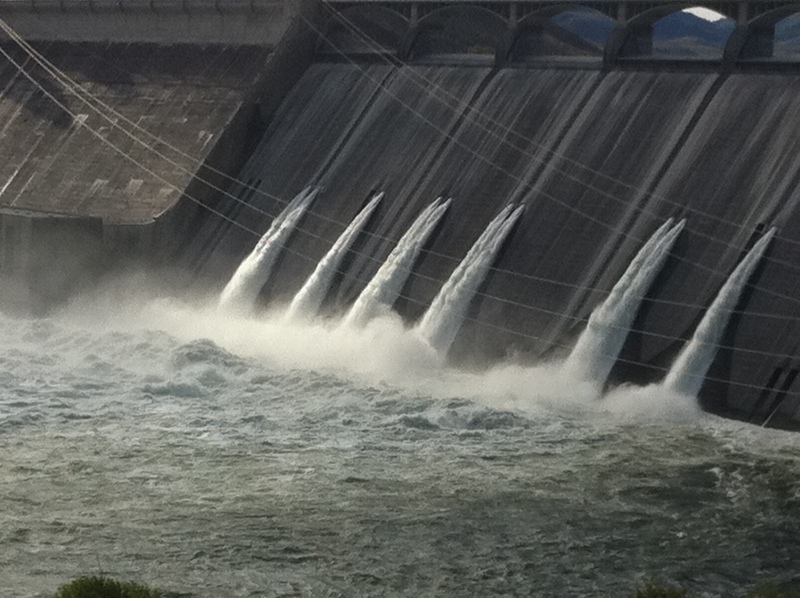 Water spilling through outlet tubes in Grand Coulee Dam inject nitrogen in water. The normal environmental mantra calls for saving electricity. Conservation is key to forming an environmentally sustainable social and industrial infrastructure. Over the long term, that is no doubt true, but at the moment in the U.S. Pacific Northwest corner of the globe, not so much. With rich hydroelectric resources and an overabundance of water heading down or toward our rivers, there is way too much power-producing capacity. The federal agency that markets power from federal dams and pretty much controls the grid has cut down on its diet of electricity from the regions blooming wind farm industry and from other non-hydro producers to favor the cheap, natural flow of kinetic energy carried by the region’s rivers, chiefly the Columbia. But even that “interim policy” of the Bonneville Power Administration has not been enough to keep from essentially poisoning one 50-mile stretch of the river below Grand Coulee Dam with, well, air. That’s right. Air, and more specifically the nitrogen in it, is killing hundreds of thousands of fish in fish farms downstream, and evidently at least some wild fish, too. The nitrogen is injected into the water at the dam as it is spilled through outlet tubes used when the water in Lake Roosevelt, which forms behind Grand Coulee Dam, is too low to spill over the top. Today, about 733,000 gallons per second are plunging into the frothy waters. The fish take in the nitrogen in their gills and get the fish equivalent of what human divers call the bends when they head toward the surface, as in when they eat. Eight of the big dam’s 22 generators are shut down for maintenance right now, but it’s a sure bet that if BPA didn’t have so much power production that it has to give it away, they’d want those generators online and making money. That seems unlikely to happen, despite the title of this post. But the situation should serve as an illustration to anyone tempted to think that so-called “green” technologies, like wind power, are as simple a solution to the quest for greenness as we want to believe. And the current glut of water in the river is not the first time wind power has caused grief as a solution that makes little sense. Grant County’s Public Utility District, which operates two dams on the Columbia, has at times found itself paying other utilties to take its electricity. It has to accept so much wind power under state law. And running the river through its turbines is friendlier to endangered fish species than gas-inducing spills. So, there have been times when the utility was buying electricity from the wind farms, had to produce its own and couldn’t sell it due to market conditions. So it had to pay other utilities to take it. Realize that the power produced at these dams hits a grid of transmission lines that spans 14 western states. So your admirable habit of shutting off the light switch or taking quick showers may or may not actually be helping the environment at any given time. This entry was posted in Latest News, Patterns and Connections and tagged Bonneville Power Administration, BPA, coulee dam, environment, fish, grand coulee, Grand Coulee Dam, hydropower, Lake Roosevelt. Bookmark the permalink. It is crazy and the regulators need to get their collective heads together and come up with some “sustainable” answers that don’t pit one energy source against another. It they can’t I guess we all will have to buy electric cars! I’d buy that, Bob! But that may be another post.